This is particularly yummy, and I've really enjoyed spinning this up. About 500g of superwash BFL, from last year's Woolfest, which I dyed up around Christmas in a variant of my Mirkwood colourway. It's slightly greener than showing here. I finally did something about it over the weekend. 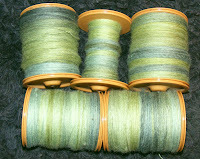 Singles all ready to be plied up. 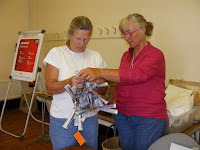 I spun long draw from the fold, pulling chunks of the top. About four and a quarter bobbins' worth, which will be tricky to divide equally into a three ply. But I'm not intending to pay any attention to where the colours fall (which works much better in a 3 than a 2ply) so I shall juggle about until I come out even (sort of) at the end. Off the needles at the weekend, Nancy Bush's Mamluke Socks. (And yes, I want to add the extra 'e' all the time). Antique sock yarn, the gold was overdyed by me over grey. I ran out of gold (barely a yard left of the teal) so the last toe is grey and teal. Lovely socks to knit, I feel an urge to get another two-colour sock on the go, but the heel - satisfying though it was to knit - is useless for feet with an instep as high as mine. 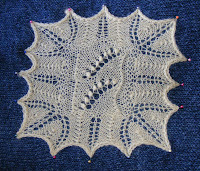 ... is now written up and on Ravelry. It's not beta'ed, but I thought I'd better get it out now rather than whenever. Sock and scarf knitting, with some rather nice superwash BFL dyed in a variant of Mirkwood on the wheel - I have lots, so it'll be a nice 3-ply. My stuff appears to be in demand! I'm just posting four packs of bouncy Mirkwood off to the US, three packs in a swap in a weaving book from Canada, and two down to Deepest Wales for a set of handmade brass dpns. ... was as splendid as ever. Slightly more relaxing than last year as I wasn't teaching. I went up there with every intention of sitting in on Pete and Carol's workshop on spindle spinning but I was completely bowled over by Averil Otiv's talk on Friday night and spent the weekend in hers. 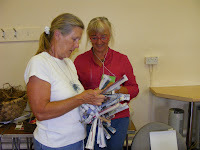 My lovely friends Hazel and India were there, and we spent most of the weekend making basket-type stuff at a table in the garden room with Ma, who astounded us all (and especially herself) by managing to produce a fantastic newspaper bias-woven basket! 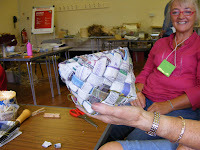 This is what I'd produced by mid-afternoon on Saturday - a small coiled dish and the start of larger oval basket. Making the cordage was addictive; I can remember, years ago, watching a television documentary about rope bridges across gores in the Andes. Local women were just sitting on steep slopes covered in dry grass and speedily spinning the grass into a strong 2-ply cord using just their hands. The cordage produced was doubled and doubled and doubled again until great thick ropes, made purely of grass, were thrown across the gorge and turned into rope bridges. Well, now I can at least make the cordage! This is what I'd done by Sunday lunchtime. 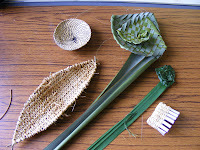 The New Zealand friendship flowers are positively addictive - I made one from NZ flax/phormium and a generic lily leaf there (and have already been using vegetation down at the reserve since) and the 'thing' at bottom right is just me working out how to do something. And I sold fibre, which is always a bonus. Now I just have the hard job of photographing it and getting it all up on Etsy. Two packets need to go to Sally in Wales in exchange for some more fabulous hand-made dpns, and I've just sold four of my favourite colour to the US. Yay! There were four of us camped out in the bar at 9pm on Friday, waiting for Torchwood's denouement. There was a few more by the end, all breathless and gasping together. I made the mistake of trying to cast on for NB's Mamluke Sock - it took me two tries and I'd only got a couple of rows finished by the end. Sock is now finished, and I'll struggle to be inspired to make another. I've knitted about six inches of the Lily of the Valley scarf, and am about to pull back to reknit on larger, pointier needles. I've been thinking that I'm not happy about the fabric being created, and it's not quite right. Buggrit! 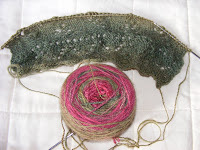 The BFL Rose laceweight is being turned into the Lily of the Valley Scarf from Estonian Lace. I did debate whether or not to use larger needles than the 3.25 the pattern originally suggested, but I've gone with this - any larger and I think the background fabric might be too holey to show off the deliberate eyelets. The colour is shading nicely. The Lavendel socks, now painted, blocked and finished. The blue is actually more purple than my monitor at least is showing - I didn't have time to fiddle with colour balances. Off to Alston Hall near Preston tomorrow afternoon for the weekend, with Ma. An annual event with varied teachers (me, last year! 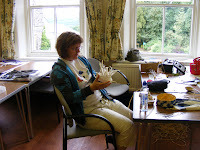 ), this year I'm ostensibly signed in with Pete and Carol for a weekend's spindling. On the other hand, I'm taking up lots of green BFL superwash top, the Suzie, two knitting projects (the scarf above and a pair of socks to cast on) and all my sock knitting books (of which I have an embarassing amount). 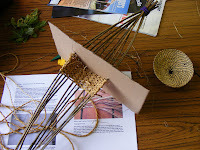 Ma is booked in for the basket making from natural materials course. Desperately need sleep, which is why I'm blogging after 11pm with a getting up time tomorrow of 5.20... It's that bloody Torchwood again. No way could I go straight to bed after all that furious durm und strang and despair and end of the worldness without a bit of a climbdown. Phew. And they'll be at least two of us in the bar tomorrow night, watching the last part. 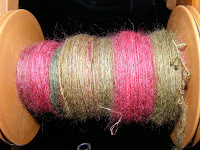 This is the BFL rose, plied up, washed and re-plied as it relaxed too much once it hit the water. I've got about 350m from 100g. The colour changes match all the way throuth - can't wait to try this. 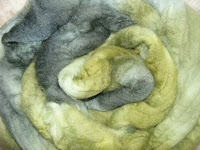 Click to embiggen - there is quite a bit of lustre there, despite the softness. 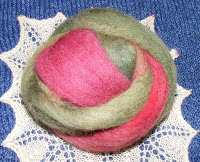 Quick sample from the Woolfest fleece I bought for me. This is a Shropshire x (BFLxTexel); extremely white, crisp, crimpy, but not coarse. Yum. Handcombed and wheelspun. This is the sampler I knitted in Saturday's class - those nupp things are addictive. And I loved how the yarn - a BFL lace that I have a cone of) has come out. Will have do do more. Off the needles this evening - I cast on the second just as Torchwood was starting, just as well it's nearly plain ribbing, couldn't have done anything complicated what with all that excitement! These are the Lavendel socks from Stephanie van der Linden's lovely sock book, which is all in German. So the heel is a Halfhandkerchief (which we did in Friday's class) and the toe is a square ordinary one. I have plans for painting them when the pair is done. And having started these socks, I managed to list my sock yarn on Ravelry. I have some to list on Etsy that didn't sell (!) 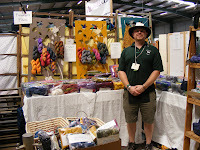 at Woolfest, and lots still to dye. I've ordered more, and the dyepots will be coming out soon. 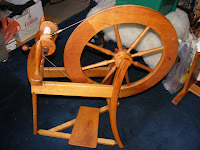 Finally got a bit of spinning done at last. This is my naturally coloured BFL top, in Rose. 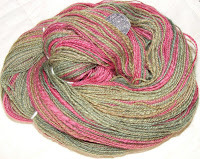 I love this fibre - dyes beautifully, spins nicely, stays light and airy. What's not to love? Managed to spin a 100g pack to fine singles and ply to laceweight between the start of the Men's Singles Final and going to bed last night. With a small amount of taking out and slipping back in I managed to get the two halves of the split length of top to match perfectly in the plying. There should be enough for one of the scarves in the Estonian lace book. I haven't photographed the samples from Friday's class, because honestly a little heap of sock heels (no matter how beautifully executed ahem) isn't going to bring the house down with excitement. There's a few more in the original Folk Socks book, so I may do those to complete the set this weekend. Phew! I had one of these yesterday, her Heels & Toes one, and it was wonderful but exhausting. Just about off to catch a bus, then another bus, then a lift over to Hebden Bridge for today's one, Estonian Lace. I must be mad, but she's an excellent teacher and I wasn't going to miss this opportunity. We are in a different pub today; let's hope the food's a bit more exciting. 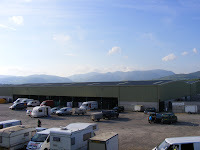 This was last Thursday evening at Cockermouth, just as we'd set up the stall, unpacked the tent, and had the panic-sticken phone call with Ma that meant we didn't have to drive back home and then back up to Woolfest that evening* I just love the view over the prosaic auction mart and carpark to the Lake District Hills to the south and east, and it had been such a beautiful drive up home. 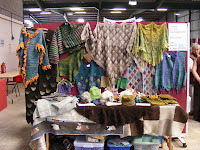 I actually remembered to take a photograph of the stall before we were run over by hordes of ravening fibre-hunters. And we were - this is the best show I've ever done. 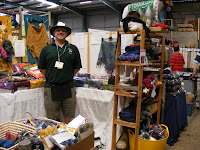 I sold lots more yarn than normal, too. *Now this was the panic. Mark and I had done everything and were casually wandering down to the bar for a drink before eating, when we came across a couple of boards and a table with a big sign on it with my name on. Eeek! Apparently, as a tutor, I got a display area/stall too. This had managed to go over my head completely, and of course I'd only brought a few bits and pieces up to titivate the selling stall. I ended up on the 'phone to my utterly wonderful mother as she wandered around my flat, collecting large storage boxes, smaller shoe-boxes of class samples, and things out of cupboards and on chairs. She turned up at 8.30 (!!!) on Friday morning, having set off about 6am, and she only stayed til after 11 because of the heat and crowds. What a star! The display stall looked great and I got lots of compliments. Even better - Nancy Bush was next to me on her little stall, and recognised me as buying yarn (twined knitting) last year. Wow. The bank behind the tent. The pups were good as gold, and when let out to maraud they only pottered around on this bank - or charged up and down madly, depending upon how they felt. 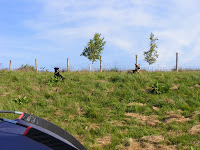 We put the large borzoi-sized crate up in the transit van and left the van's doors open - they were much cooler in there than even the dogs on stalls, lying on concrete. 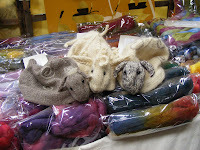 My three knitted sheep hats just before I abandoned them to their fate at the auction. To my delight the grey one won the best in show, and I have a lovely big red knitted rosette to show for it. I was presented with this in the middle of my class on Saturday. 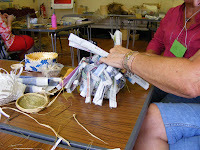 Actually, both days' drumcarding classes went extremely well, even though I had ten people on one day, twelve on the next, only an hour and six drumcarders (one of which really was past it) and extreme heat to contend with. And I didn't buy too much. Some books, (especially pleased with Janet Arnold's book on historical underpinnings,and I got Nancy to sign her Estonian Lace book), a bit of fibre (a fleece to dye and sell, a fleece for me, some dyed alpaca from Denise, some dyed merino/tencel from CArol and Pete for which I think I'm trading a hat) and a few other bits and pieces. I meant to get some new knitting needles but that missed me completely. My feet hurt for ages. It's still too hot here.